Such monitoring is about more than “watching a screen”. 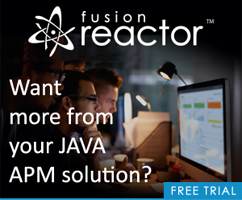 You can arrange to receive email alerts with valuable information (sort of a black box recording before a crash), and FusionReactor also creates really valuable logs that can also help with post-mortem analysis. They can also assist with deciding on CF server configuration settings, watch trends for hardware upgrades, and more. And as of FusionReactor 4, these logs now track information that previous only the CF Server Monitor displayed (but didn’t log at all). Finally, an additional tool, FusionAnalytics, can help analyze and visualize that data over minutes, hours, days, weeks, months, and so on.